Foreign Affairs Minister Chrystia Freeland speaks with the media during a news conference in Ottawa, on Dec. 12, 2018. Donald Trump’s steel and aluminum tariffs contradict a key component of the new North American trade agreement – the pivotal section on autos – which will ultimately lead to their demise, Foreign Affairs Minister Chrystia Freeland says. 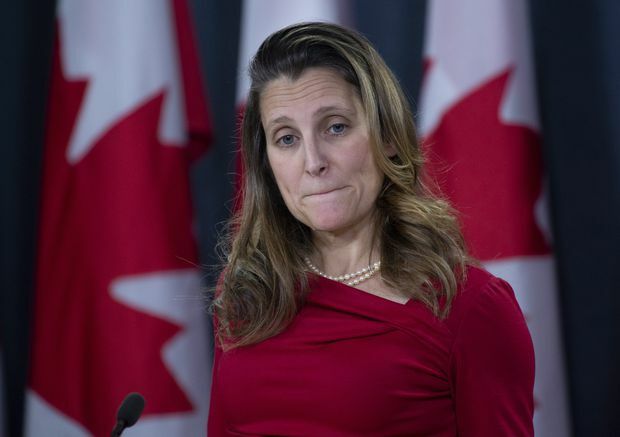 U.S. businesses are making that argument, and Ms. Freeland said that gives momentum to Canada’s continuing efforts to have the levies lifted in 2019. The minister said Canada’s fight to remove the tariffs, imposed by the U.S. President, is being aided by the broader calls from American business to have them lifted before the new continental trade pact is ratified. Their argument centres on the fact that a major section of the new agreement – known as the Canada-United States-Mexico Agreement, or CUSMA – focuses on raising the content requirements of North American-built cars, Ms. Freeland said. The rules on origin for automobiles were a key sticking point throughout the contentious 14-month renegotiation of the North American free-trade agreement. During the negotiation, Mr. Trump also imposed a 25-per-cent tariff on Canadian and Mexican steel and 10 per cent on aluminum, using a section of U.S. trade law that gives the Oval Office the authority to do so under a national security provision. Ms. Freeland and Prime Minister Justin Trudeau have assailed what are known as the section 232 tariffs as illegal and insulting, given the close military and security relationship between Canada and the United States. Ms. Freeland said that U.S. businesses are having a hard time swallowing the fact that there is a tariff on a key component of autos – steel and aluminum. “There is an internal contradiction in having tariffs on Canadian steel even as there is a built-in requirement for North American steel. So I do feel the Canadian case, which has always been very strong, is only getting stronger,” Ms. Freeland said. Canada, the United States and Mexico signed the new agreement on Nov. 30, but it needs to be ratified by each of their legislatures – which could make for a bumpy ride through the U.S. Congress after the Democrats recently won control of the House of Representatives. Mr. Trudeau said Canada has plenty of support among U.S. lawmakers and businesses as it continues to press for the removal of the tariffs. “We have a broad alignment both on the benefits of trade between Canada and the United States, the negative impacts of tariffs that we hear from members of Congress, from business leaders and governors – how much they are very much aligned with us in trying to remove these unfair tariffs on steel and aluminum,” Mr. Trudeau said in an interview last Friday with The Canadian Press. Last week in Washington, Ms. Freeland said she and Defence Minister Harjit Sajjan made the case for tariff removal once again with their counterparts, Secretary of State Mike Pompeo and Defence Secretary Jim Mattis. Ms. Freeland also met with U.S. Trade Representative Robert Lighthizer, her counterpart in the NAFTA talks, to push the point. Ultimately, it will be the U.S. Department of Commerce that decides the tariff question, but Ms. Freeland said Ottawa’s approach is “to keep banging away” at multiple U.S. departments. Mr. Trump’s ambassador to Canada, Kelly Craft, said the commerce department is actively engaged in making a decision on the tariffs. “It’s an ongoing conversation within our commerce department, and I know that they are actively engaged in trying to make a decision,” Ms. Craft told a small group of reporters in Ottawa last week.